How close is the property to the beach? What time is check-in? What time is check-out? Are there a minimum number of nights required? Is there a minimum age requirement? Do you require a deposit? How many people will the property sleep? Can I bring my pet? Does the property have a swimming pool? Is there a bar-b-q grill? Does the property have Wifi? Do I need to bring ______________? Does the property come with ______________? How far are you from Corpus Christi? How far are you from downtown Corpus Christi? How far are you from Corpus Christi International Airport? Can we build a fire on the beach? Where can I park my boat trailer? Where is the closest grocery store on North Padre Island? Are public boat ramps available? Where is the closest post office? I forgot something at the property, can you mail it to me? How close is the property to the beach? Padre Escapes' properties vary in distance from the beach. Some properties are beachfront while others are 1-2 miles away. 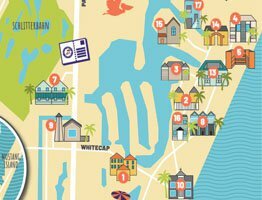 Within each property description you will find a map section which will show the location of that exact property and how far it is from the beach. Feel free to call us for more details as well. Check-in is at 4:00PM, our office is open from 9-6 Monday-Saturday and Sunday 11-6 (extended hours during summer season). All check-ins are at our office located at 14945 S. Padre Island Dr. except stays at El Constante which will check-in at their front office located at 14802 Windward Drive. If you will be arriving after hours, please call our office to make arrangements to pick up your keys. If your property is available earlier you will receive a text message notification on the day of your arrival. Check-out time is 11:00AM. You may prearrange for a late check-out, if available, for a fee of $25/hour. Are there a minimum number of nights required? Yes each property has at least a two night minimum. Some properties have a 3 night minimum and others have a 7 night minimum however some exceptions can be made for last minute bookings. Yes, Padre Escapes has a minimum age requirement of 25. Padre Escapes does not require a deposit, we do require an active credit card be on file for every stay and this card will be charged if damage is found or excessive cleaning is needed. We also require every guest to purchase a property usage fee which varies in price depending on the size of the property you're booking. How many people will the property sleep? The maximum occupancy for each property is listed on the property description page. Adults and children count against the occupancy. You are not allowed to have more guests in the property than the maximum occupancy states. We will make an exception for one child under the sage of two. 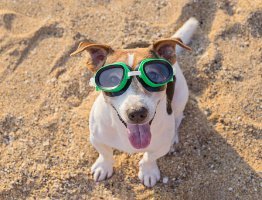 Padre Escapes does offer some pet-friendly properties. Pets are only allowed in pet-friendly properties and there are additional fees associated with having a pet in a property. If an unreported pet is found to be staying in a property, the guest will be charged $500.00 and be asked to leave without a refund. Is there a bar-b-q grill? 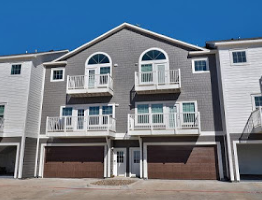 Many of the properties come with community grills that are available to the entire complex. A handful of properties have private grills, and some have no bar-b-q grills available. You can check the standard amenities list for each property or contact us and can confirm whether a grill is available or not. Just about all of our properties offer a private Wifi network. If it is not clear whether a property has Wifi or not please feel free to contact us to confirm. Do I need to bring ______________? Every property comes with towels and wash cloths for the maximum occupancy of the property, hand towels are in every bathroom. There are sheets pillows and comforters on every bed. A small starter supply of the following items is provided as a convenience until you have time to shop: a sponge, bath soap, dish soap, dishwasher detergent, laundry detergent, paper towels, toilet paper, trash bags, and make-up remover wipes. These items will not be replenished during your stay. The following items are not supplied so we recommend you bring them with you: beach/pool towels, sunscreen, beach gear, shampoo and conditioner, food, spices, condiments, coffee, etc. Does the property come with ______________? Padre Escapes' properties come with pots & pans, dinnerware & glassware, silverware, and cooking utensils, cookware, microwave, coffee maker, toaster, blender, measuring cups and spoons, hair dryer, iron and ironing board, pillows and blankets for every bed and more. Please call if you have any questions on other specific items. How far are you from Corpus Christi? All Padre Escapes properties are located on North Padre Island and they are all within Corpus Christi city limits. How far are you from downtown Corpus Christi? Our office is approximately 22 miles from downtown Corpus Christi. It takes 20-25 minutes to drive to downtown Corpus Christi. How far are you from Corpus Christi International Airport? Our office is approximately 24 miles from Corpus Christi International Airport, it takes 20-25 minutes to drive to CCIA from our office. Can we build a fire on the beach? Fires no larger than 3’x3’ are allowed on the beach as long as they do not present a risk of starting larger fires. Padre Escapes has three reserved parking spaces at a local storage complex that can be used for trailer parking for $50/stay (short-term stays only). They are available on a first come, first use basis and cannot be guaranteed. There are only a few complexes that will allow trailer parking. Call for details on those. Where is the closest grocery store on North Padre Island? There is currently no grocery store on the island, however one is under construction. There is a CVS and Dollar General that have a small amount of groceries and several of the Island convenience stores offer a few groceries. The closest grocery store is the HEB Plus in Flour Bluff which is a 10-minute drive away. Are public boat ramps available? There is one public boat ramp available at Packery Channel on Zahn Rd. 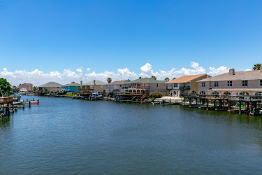 There are private boat ramps available through the Padre Isles Home Owner’s Association, we do provide passes to those ramps for guest use for $50 each when available. I forgot something at the property, can you mail it to me? Padre Escapes will not be responsible for items left in properties after check-out. Please notify us as soon as you realize you’ve forgotten something and we will make every effort to locate and return lost and forgotten items when the property is unoccupied but there is no guarantee they will be found. If a guest leaves an item in the property and wishes to have it mailed back to them they will be required to pay for the postage as well as a $25 service fee. Any forgotten items must be retrieved within 10 days or they will be donated to a local charity.